One would be hasty to conclude that his adviser is a good one just because he is Independent. On the same online forum, I recently discovered that even an IFA representative does not even know the difference between a rider that pays a Total and Permanent Disability (TPD) benefit from Disability Income Insurance! Such a mistake is easily made by a layperson. This is perfectly understandable as the terms may seem confusing. For a practitioner however, it is quite inexcusable, but the standards in this industry is so appalling I am not surprised by much anymore. Regulators have mandated tests, and the textbooks for such tests have even took the effort to dedicate an entire section on Disability Income, as well as an entire subsection on the specific differences between Disability Income and TPD. Yet, practitioners who have supposedly passed these (simple) tests cannot differentiate between the two. What a joke. In my opinion, there are three criteria that clients can look out for in an adviser. Merely being Independent and having a wide range of financial solutions isn’t enough. The adviser can even be ethical but without proper competency, how can he properly benefit his clients? 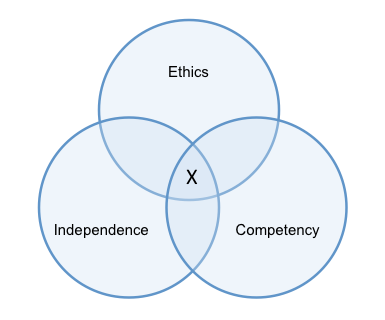 People should look towards advisers falling under X. For existing practitioners and people looking to join the industry who have emailed me, you should realise that moving to an Independent platform isn’t enough.